Earlier this week, some readers were asking me in emails for good examples of "simple yet effective" slides. Well, you can see some good examples — one man's examples — if you take some time to watch how Steve Jobs used slides to support his presentation in yesterday's special Apple event at San Francisco's Moscone West. Your own style and use of visuals will be different and unique to your own situation, of course. But I think we all can learn a lot by observing Jobs and being mindful of his natural interaction with the audience and his visuals as he tells "his story." David Hornik over at VentureBlog also suggests you check out Steve Jobs' presentation to see a real "Master of the demo" at work. Below I display some samples from Steve's presentation. 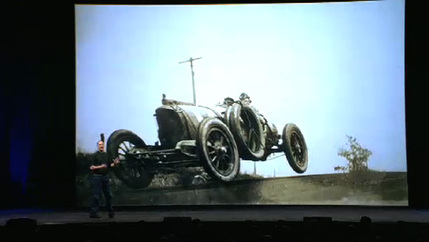 You can watch the entire one-hour presentation in QuickTime on the Apple website. 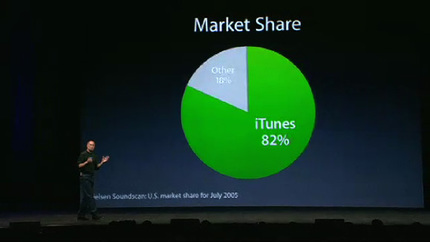 Discussing the popularity (and dominance) of iTunes for the legal downloading of audio. 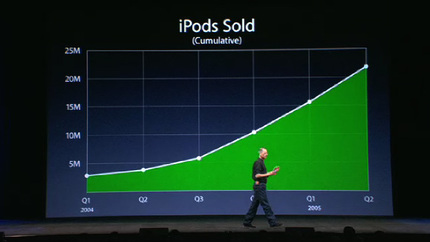 Talking about the growth of iPod popularity, highlighting cumulative sales from Q1 2004 to Q2 2005. 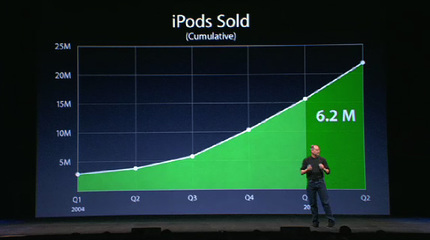 Latest quarter fades to darker green as "6.2M" also fades in as Steve states that over six million have been sold in just the last quarter alone. Green, by the way, is a good color choice for showing sales growth as green connotates many positives such as growth, safety, money, harmony, and so on. But is sales of 6.2 million good or bad? How does that stack up? 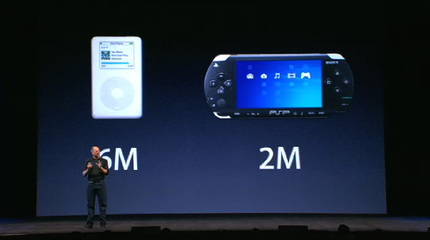 To give the number perspective, Steve compares the "6M" to another popular device, the SONY PSP which sold "2M" in the same time frame. Steve continuing his talk on automotive accessories. Note that the slide would be meaningless with out the narration. This "zen approach" makes the slide very effective. To stress the diminutive size of the new iPod Nano, Steve first teases the audience: "Did you ever wonder what this pocket is for?" he says, pointing to the mysterious "fifth pocket" found just above the right pocket in most jeans. "I've always wondered that...well now we know..." And with that Steve pulls out the iPod Nano to the delight (and gasps) of the audience. A good solution to the problem of showing such a small product to a very large room: Turn your projector into a large TV screen. This is something you can actually do with any video camera and most projectors. Thanks, Dimitar. I've included that link now in the main body. Good stuff. Not so sure why are you all so excited about all this. It is very easy to be simple and elegant when a) you're already heavily successful and b) your success is focused in a single tiny point. Don't get me wrong, I do not anyhow want to underscore what Apple has done. 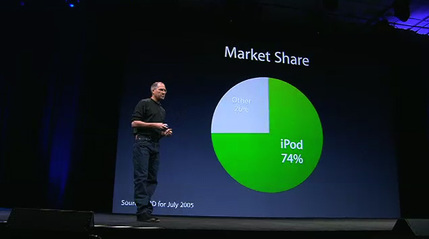 My point is that the iPod and the related iTunes business were THE topic for Apple this past year. It's darn simple and easy to stress on numbers there. But it's also important to find out whether the people wathing the presentationa actually learned anything beside what they already knew from the mainstream newspapers. 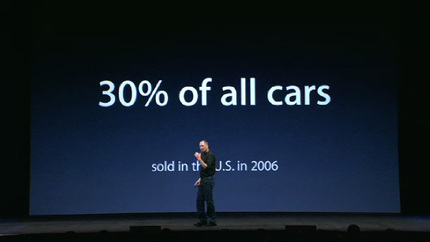 I didn't see Jobs' presentation, but there was little, if anything, from the above screenshots, that I didn't know.